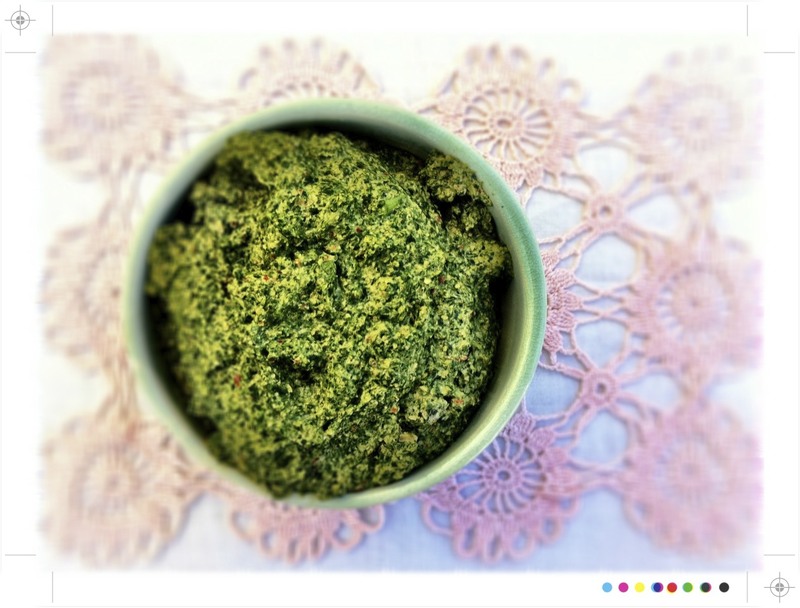 A big bag of spinach and what better way to use it up than in a herby pesto to be stirred through some warm pasta? I have also been watching Donna Hay's Fast, Fresh, Simple now airing here in New Zealand. I have always been a fan of Donna Hay's recipes as they are indeed fast, fresh and simple but there are always just a few new variations to add to the repertoire for a quick weeknight supper, and I do like variety. She also has some fail proof little secrets. How do you guarantee a meltingly gooey centre to a chocolate pudding? Simply pop in a square of chocolate and guaranteed every time. I am also a fan of Donna's beautiful food styling, bright and clean. And that is the added bonus with this show, not only do you get some great recipes but also a wee bit of lesson in how to make your plates look ever so pretty. My favourite tip so far is how to get that perfect pile of pasta on the plate. All one needs, some tongs and a plate, twirl one or the other and there you have it a perfect mound of pasta. This post would actually have been up sooner with some perfectly OK photos of beautiful green pesto, but on seeing Fast, Fresh, Simple it had to be a twirled pile of pasta for this post. Really you can use whatever you have to hand or whatever herbs you like. A little basil would be great, or a fresh hit of mint or for a an Asian inspired pesto throw in some coriander. As for the nuts the classic pine nuts are always good, but why not give some cashews a go? 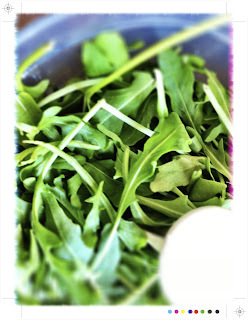 I also like a little lemon zest in pretty much anything, it just adds such a welcome bright burst of flavour. Well they are hardly directions really. Throw everything in to a food processor and blitz to a puree, as rough or as smooth as you like. And there you have it a bright green pesto just waiting for a large bowl of pasta. Cook your pasta of choice in plenty of boiling well salted water for a minutes less than the packet suggest so that it retains just a little bite. Drain and stir through the pesto. 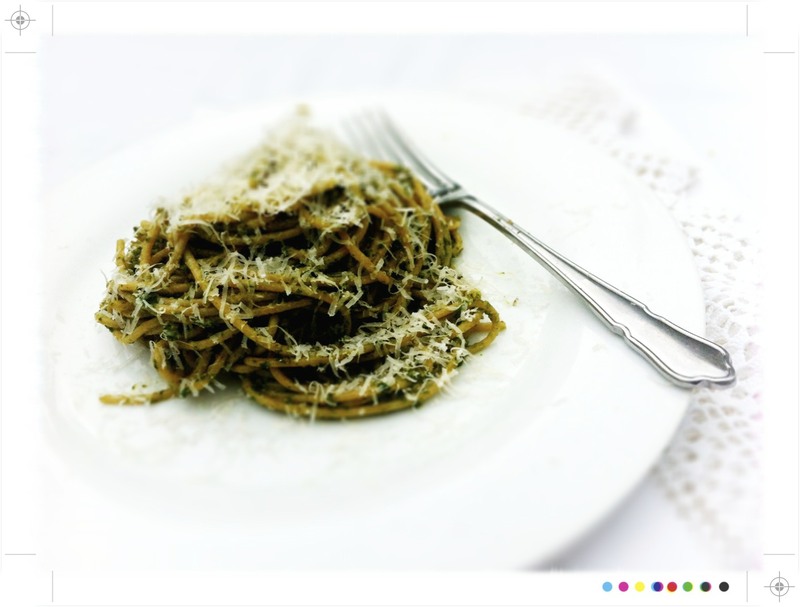 You want enough pesto to coat each strand. Pile, or rather twirl, on to a plate and scatter a generous amount of Parmesan over the top. The pesto was full of herby goodness, the walnuts adding a nutty, slightly creamy note and the rocket delivering a wonderful peppery hit. If you are not a fan of pasta try a dollop or two on top of some grilled chicken or serve as pre dinner dip. 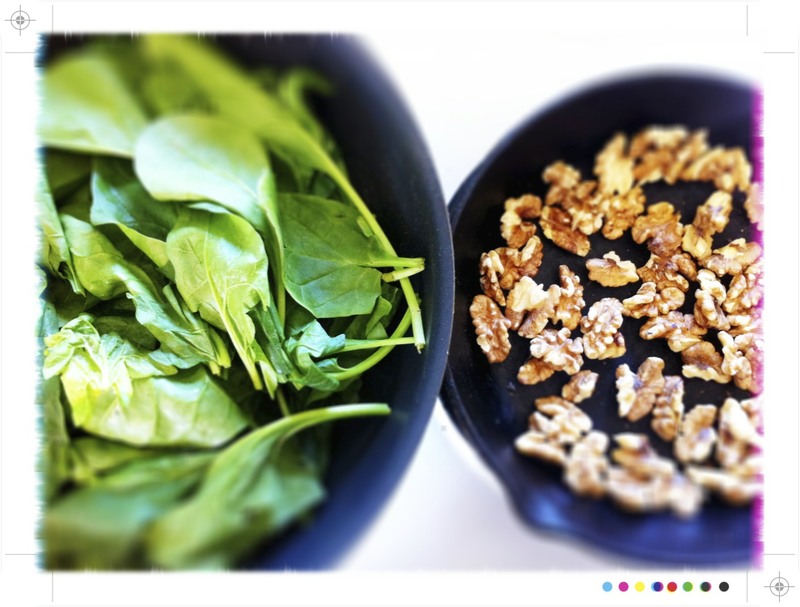 Oh, I love this combination of walnuts and spinach - lovely suggestions, too for other variations. 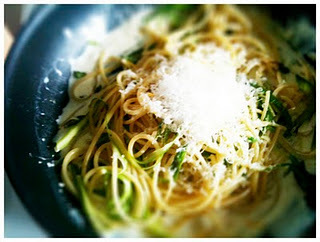 And what a beautiful pasta twirl! I have read some good stuff here. Certainly value bookmarking for revisiting. I wonder how much effort you place to make one of these fantastic informative website. Thank you for the Pasta Twirl, Mairi! I've always wanted to do that ;-). Wow, that's one show I'd like to watch. Most cooking shows here have turned into "dramas"...except for a few good ones on the Cooking Channel. 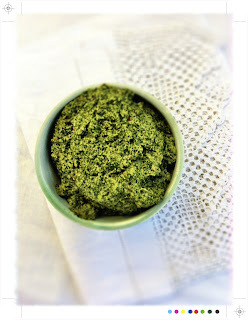 @Alessandra Thanks Alessandra...I agree, I love pesto with just about everything. @Hannah Thanks Hannah...I was quite excited about the pasta twirl! @wedding venues Thanks for stopping by. @Annapet Thanks Annapet...I have been loving the show, great food & recipes but always such pretty, pretty plates.